Covers the normal and emergency vapour venting requirements for aboveground liquid petroleum or petroleum products storage tanks and aboveground and underground refrigerated storage tanks, designed for operation at pressures from full vacuum through 103,4 kPa (ga) [15 psig]. Discussed in this International Standard are the causes of overpressure and vacuum; determination of venting requirements; means of venting; selection, and installation of venting devices; and testing and marking of relief devices. Intended for tanks containing petroleum and petroleum products but it can also be applied to tanks containing other liquids; however, it is necessary to use sound engineering analysis and judgment whenever this International Standard is applied to other liquids. This International Standard does not apply to external floating-roof tanks. 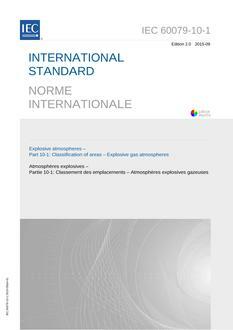 This edition of API Std 2000 is the identical national adoption of ISO 28300:2008, Petroleum, petrochemical and natural gas industries-Venting of atmospheric and low-pressure storage tanks.